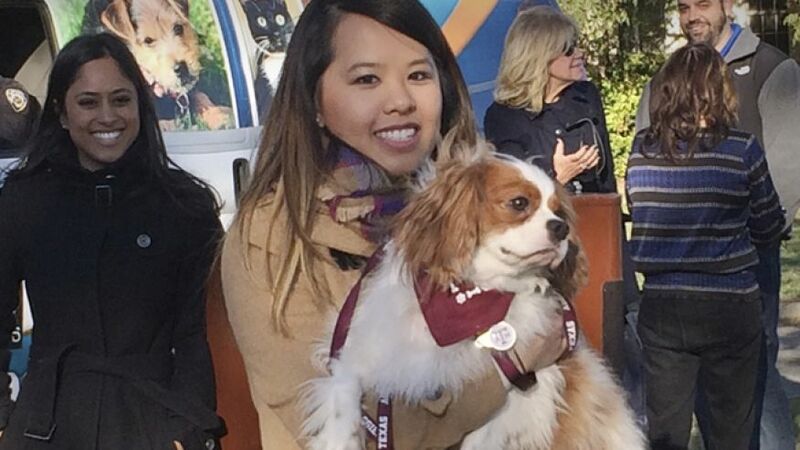 DALLAS – A Dallas nurse who recovered from Ebola has been reunited with her dog named Bentley, who has been quarantined since she fell ill.
Nina Pham and the King Charles Spaniel were reunited privately on Saturday in a vacant residence where officers once lived at a decommissioned naval air base, where he was quarantined for 21 days. Veterinarians in full personal protective gear checked on him daily. Pham was diagnosed with Ebola last month. She contracted the virus while caring for a Liberian man, Thomas Eric Duncan, who died Oct. 8. Earlier this year, authorities in Madrid, Spain, caused a public uproar when they euthanized a dog belonging to a nursing assistant sickened by Ebola. Rawlings thanked city staff and Texas A&M University veterinarians.